We've done the Easter goodie hunting for you, with our round-up of handcrafted Easter basket toys and treasures that will delight every child. For example, the crochet wooden eggs shown above. 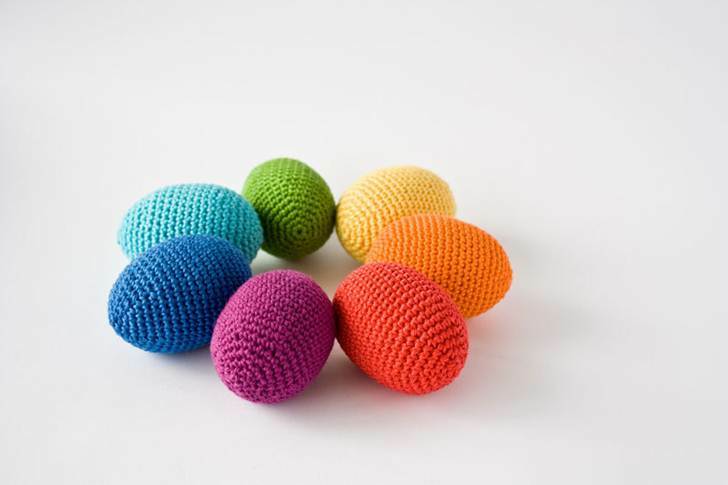 These cheerful eggs are made with a wooden base and covered (crocheted) with 100% cotton thread. They're safe for kids of all ages, but will especially enchant your baby, who can use them as a safe teething toy. 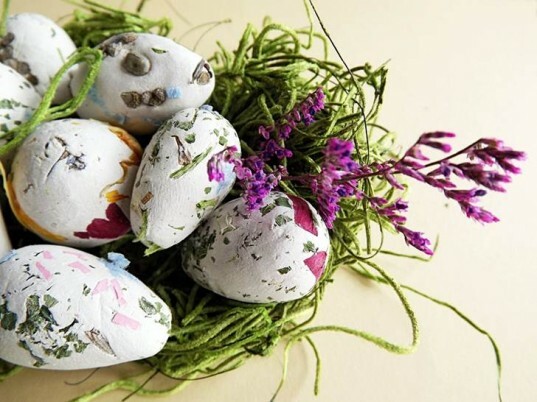 These colorful eggs can also be used as a beautiful spring decoration for your home. Many colors are available to choose from. Keep reading to see six more lovely handmade Easter goodies to brighten every basket! These little jelly beans are almost good enough to eat (almost). 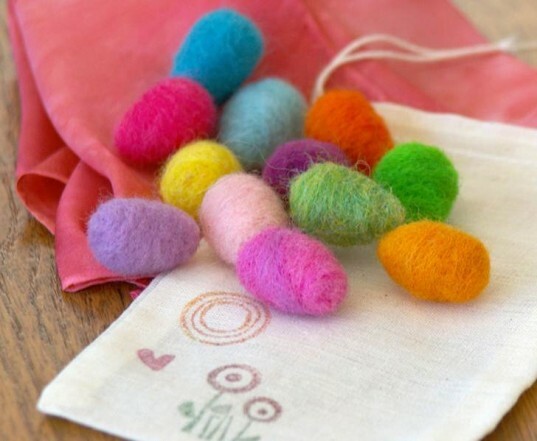 Made to size, each tiny jelly bean has been needle felted with wool and comes ready-to-gift in a hand-stamped muslin pouch for carrying and storage. Kids will love to add this holiday food item to their play kitchen, or they can simply use them when their pretend play calls for a sweet treat. Each set includes 12 jelly beans in a rainbow mix of brights and pastels. Keep in mind that due to their small size and tasty appearance, these tiny beans are not suitable for children under 3 years of age. These beautiful eggs were an Etsy Front Page Pick and really capture the natural delight of the spring season. The set comes with six beautifully realistic hen eggs made of real wood. 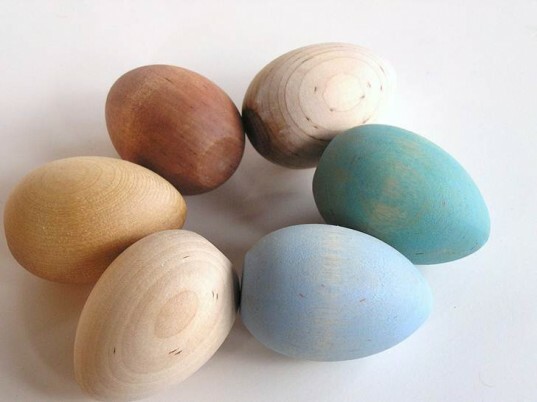 Each little egg is hand sanded smooth and then hand-painted with all natural non-toxic soy paints in shades of blues, browns, whites and natural wood. Once dried, the eggs have been sealed with Apple n Amos’ own olive beeswax polish. Perfect for an Easter treat or as a year-round addition to your child’s play kitchen set. Hoooo is that hopping down the lane? It’s not the Easter bunny, but a sneaky baby owl using his imagination this Easter. This little owl is the size of a small clementine fruit and is hand-knit with luxuriously soft, high-quality alpaca wool and a merino/angora knit hat. 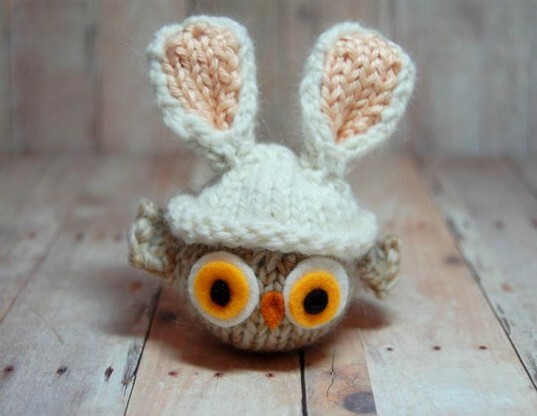 You can use this tiny owl as an ornament, office companion, toy, room decoration, baby shower gift and much more — but at this time of year he also makes a perfect Easter basket addition. This Easter bunny… ahem, Easter owl, will delight your child this season and arrives beautifully wrapped in tissue paper tied with ribbon. 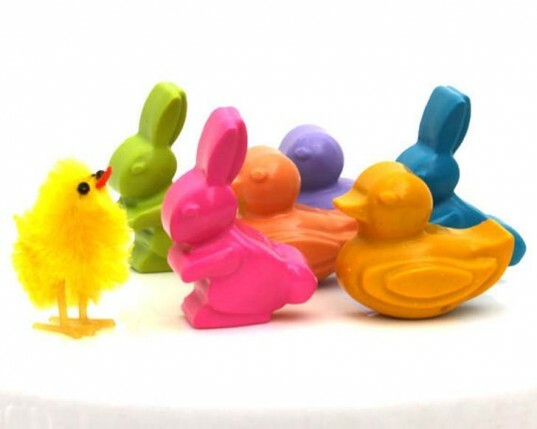 This adorable set of six handmade Easter crayons will add color and fun to any Easter basket. Crayons are hand-poured, and made from discarded crayon bits collected from local elementary schools. The set comes with three bunnies and three ducks, each nestled in its own wrapper. Gift box included. This Easter, surprise your kids with their very own Easter themed finger puppets. The listing is not for the finished puppets, but is for easy to follow PDF patterns that allow you to use eco-felt and make these yourself. In fact, this is a great idea for an Easter craft you can do with your kids. These PDF patterns will make five finger puppets: Pa Chicken, Ma Chicken, Lil’ Chicken, Baby Chick and Mr. Bunny. These are super easy to make and kids can use them for lots of Easter-minded pretend play fun. As an alternative to Easter candy or plastic eggs, why not slip a couple of these beautiful seed bomb eggs into Easter baskets? Each of these Easter egg shaped seed bombs are packed with top quality organic flower seeds that attract hummingbirds and butterflies. Shaped and textured by hand, each egg measures approx. 1 inch and holds a lot of seeds. The eco-friendly seed bombs range in color, depending on the variations in their composition. All egg bombs are created with organic seeds, recycled paper, clay, botanical, soil, and blooming food to help your seeds become beautiful flowers. Kids will love to see their eggs turn into pretty flowers, so truly, this is an Easter gift that just keeps on giving, or growing as the case may be. These beautiful eggs were an Etsy Front Page Pick and really capture the natural delight of the spring season. The set comes with six beautifully realistic hen eggs made of real wood. Each little egg is hand sanded smooth and then hand-painted with all natural non-toxic soy paints in shades of blues, browns, whites and natural wood. Once dried, the eggs have been sealed with Apple n Amos' own olive beeswax polish. Perfect for an Easter treat or as a year-round addition to your child's play kitchen set. Hoooo is that hopping down the lane? It's not the Easter bunny, but a sneaky baby owl using his imagination this Easter. This little owl is the size of a small clementine fruit and is hand-knit with luxuriously soft, high-quality alpaca wool and a merino/angora knit hat. You can use this tiny owl as an ornament, office companion, toy, room decoration, baby shower gift and much more -- but at this time of year he also makes a perfect Easter basket addition. This Easter bunny... ahem, Easter owl, will delight your child this season and arrives beautifully wrapped in tissue paper tied with ribbon. This Easter, surprise your kids with their very own Easter themed finger puppets. The listing is not for the finished puppets, but is for easy to follow PDF patterns that allow you to use eco-felt and make these yourself. In fact, this is a great idea for an Easter craft you can do with your kids. 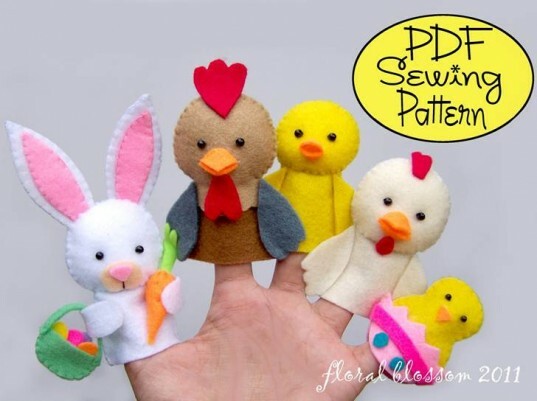 These PDF patterns will make five finger puppets: Pa Chicken, Ma Chicken, Lil' Chicken, Baby Chick and Mr. Bunny. These are super easy to make and kids can use them for lots of Easter-minded pretend play fun.